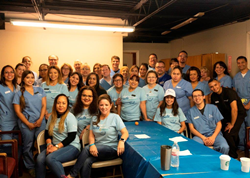 Monarch Dental partnered with the Smiles for Everyone Foundation and opened its San Antonio office to provide free dental services for underinsured, low-income individuals on April 6th. The next Day of Giving that the Foundation will be hosting will be in Mesa, Arizona on April 14th. Please visit http://www.smilesforeveryone.org for more information. Monarch Dental provides general dentistry, children’s dentistry and specialty care services such as orthodontics, oral surgery, periodontics and endodontics at 89 locations throughout Texas, Arkansas and Utah. Monarch Dental affiliated practices make it easy and affordable for individuals and families to get the dental care they need with convenient locations, extended hours and same-day appointments. The Monarch Dental mission is to create healthier smiles by making dental visits easy and enjoyable. Learn more at http://www.monarchdental.com. The Smiles for Everyone Foundation is a 501(c)(3) nonprofit organization with the mission of delivering smiles for everyone by providing free dental care for those in need, both at home in the U.S. and around the world. Since 2011, the Smiles for Everyone Foundation has delivered over 20,000 smiles and nearly $16 million in donated dentistry. The foundation currently supports programs which provide free dental care to those in need in Cambodia, Ghana, Laos, Nicaragua, Paraguay, Thailand, and the United States. For more information or to make a donation, visit http://www.smilesforeveryone.org.